DOCTOR WHO - Remembering Revenge of the Cybermen | Warped Factor - Words in the Key of Geek. Tony Fyler digs out a golden oldie. 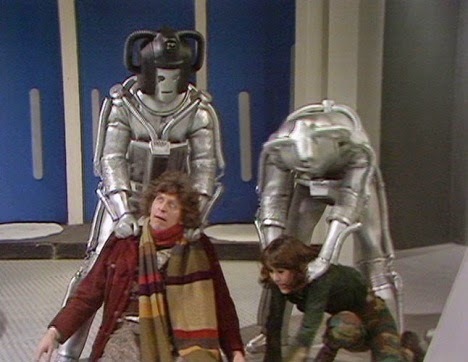 What can you say about Revenge of the Cybermen? In the age of million-strong CG Cyber-armies marching in unison across any vista you choose to name, the image of Revenge’s handful of redesigned (no, really, they made them look like that) 70s Cybermen, stooping to get through airlock doors and frankly prannying about in Wookey Hole almost makes you want to ruffle Revenge’s hair and send it out to play with a biscuit. But that’s retrospect for you. At the time, Revenge of the Cybermen was a relatively big deal – it would set the seal on Tom Baker’s first season as the Doctor, with his inherited companions and largely inherited format. More importantly, it would be one last opportunity to impress on the audience how different this Doctor was from the suave Jon Pertwee incarnation. And oh yes – it would bring back the Cybermen for the first time in five years, giving the logic-driven cyborgs their first outing since the show went into colour. The title made no bones about what we could expect. 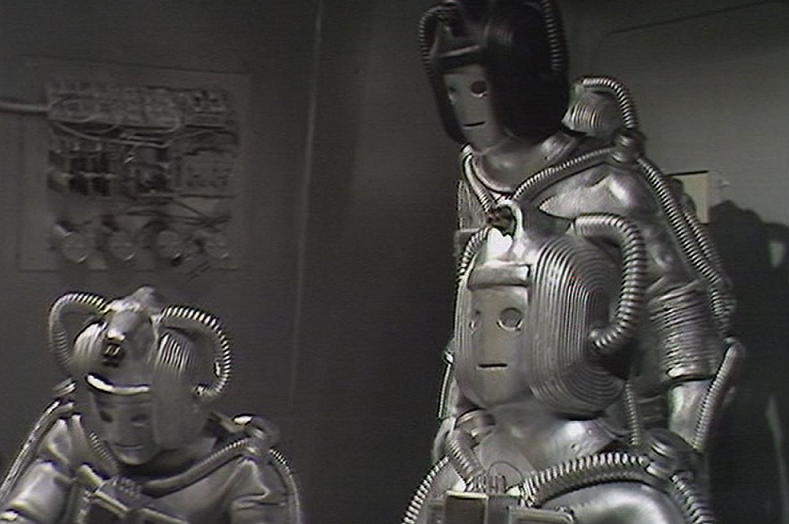 In a rare move for Cyber-stories, it put the Cybermen right up there to make you tune in and keep you watching – in exactly the same faintly cynical way that almost evvvvvery Dalek story has ever done. If you have a major star monster, almost the whole point of using them was to shout about it and get people to watch – especially in the pre-video days when if you missed it on its single transmission, that was it, you’d missed it (weep for us old fogeys, my Who-children). What followed was sadly, all faintly familiar from the black and white days. Mysterious plague in a base under siege - oh look, there’s a Cybermat. Not that the title left any room for suspense in any case, but if it had, that was that element blown. Then there’s the overly complicated plot. 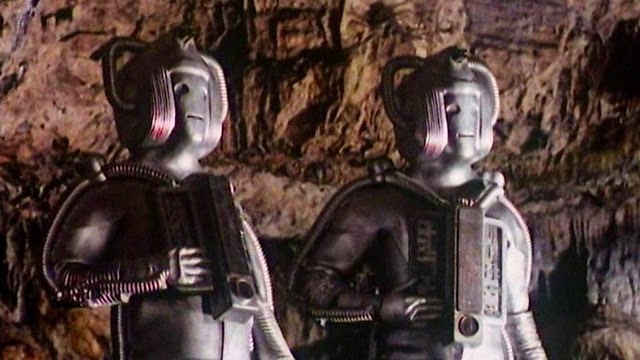 The Cybermen have a real bee in their handle-headed bonnets about Voga, the planet of gold, because gold in the chest unit suffocates them, and people had used Voga’s gold to invent the fabulously camp-sounding glitter gun, and so almost wiped them out in a great war. So…logically…the thing to do before embarking on a grand second campaign is to blow the bejeesus out of Voga before you start. So, erm, why poison the crew of the space station that orbits Voga? Ah, well you have to do that so you can have three humans left to carry bombs down a shaft made by the exographer-turned-traitor Kellman, and blow the planet to bits. Naturally. Except of course Kellman, like all good traitors, is actually working for a power-hungry faction among the Cybermen’s enemies, the Vogans, who aim to get the Cybermen all nice and comfy on the space station – and then blow them out of the sky forever with a big rocket. Despite the Cybermen having a spaceship of their own, to which they could simply return when they saw the rocket coming, and handily naff off, avoiding the impact. It’s important to realise that a) this was a Gerry Davis script, and it probably wasn’t the one he had in mind – it has since come to light that he’d pitched a Cyber-origin story, somewhere between Genesis of the Daleks and Big Finish’s Spare Parts, and b) the production team themselves weren’t particularly happy with the result. But with a budget blown on outside filming for the Sontaran Experiment and the realisation that the Invasion’s Cyber-suits would never pass muster in the age of colour, meaning a need to make new ones, the team were stuck with having to base a story largely on The Ark In Space’s set, and that was that. Revenge was essentially a Second Doctor story that needed maybe one or two more edits if it had any hope of making sense. It never got them. But once you accept that the story’s going to make very little sense – once you’ve learned to love Revenge of the Cybermen and stop worrying – its riches do appear, glittering like the planet of gold itself (Yes, yes, I’m aware that Voga never actually glittered and looked like the inhospitable lump of rock that is Wookey Hole, but you get the idea). The double-agent betraying the Cybermen plot would also go on to be lifted practically wholesale for Attack of the Cybermen, with Lytton taking the place of Kellman, the Cryons taking the place of the Vogans, and the Cybermen, for *cough, cough* scientific reasons, still intent on blowing up a planet (albeit in the second outing, their adopted home world, Telos). The whole ‘Cybermen defeated by gold’ thing that now seems such a fundamental part of their make-up was only brought in in Revenge of the Cybermen, Davis writing in an Achilles heel that would go on to become so much a part of their inevitable defeat that, by the time Ace was killing them, Dennis the Menace style with a catapult and some gold coins in Silver Nemesis, it became an almost pantomime weakness. 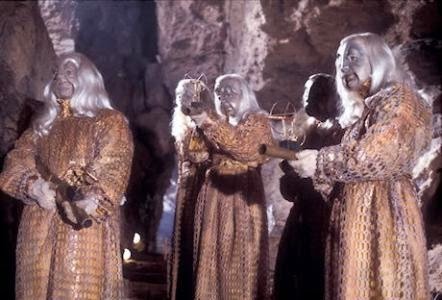 Not so in Revenge though, where for reasons that continue to make no sense, the Vogans don’t appear to have any gold-based weapons that would be effective against the Cybermen, and the Doctor and Harry ultimately fail to get gold dust into the Cyber chest-units and instead have to leg it. But despite these important steps in Cyber development – humanoid voices, traces of emotion, gold, the black-handled Leader – perhaps the ultimate legacy of Revenge of the Cybermen isn’t to do with their development at all. Watch it again, and see Tom Baker fly in his interpretation of the Doctor. In terms of a barnstorming first season, it’s been a hard one to beat, lining up old returning enemies alongside some new classic foes, but Baker in Revenge is positively masterful – and occasionally scary. Watch him prepare to deliberately infect Kellman with the ‘plague’ to get information and you remember that this is your Doctor, technically torturing a man, there on screen. We’re not in safe Jon Pertwee territory anymore, boys and girls. Hear him rant to the Cyber Leader about how the Cybermen “have no home planet, no influence, nothing! You’re just a pathetic bunch of tin soldiers skulking around the galaxy in the remains of an ancient spaceship,” and you hear an alien disdain that certainly hadn’t been part of the character’s make-up since before we’d learned he was actually an alien. 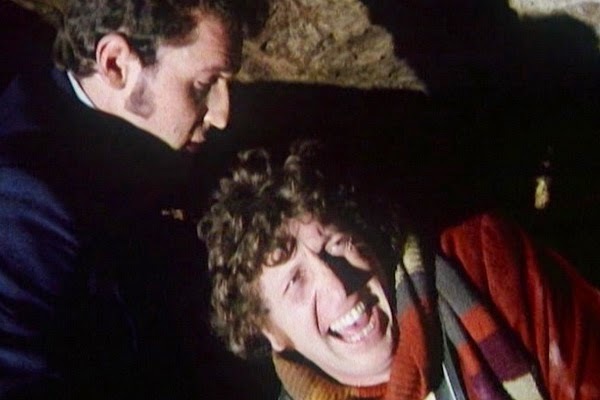 Watch the scene in the caves where he roars “HARRY SULLIVAN IS AN IMBECILE!” before falling immediately unconscious, and once you’ve stopped laughing, try imagining that coming out of any other Doctor’s mouth. It’s a moment of delicious Bakerness that no-one before him would ever have attempted. Watch him in the caves, declaring that his idea is better than that of his fellow walking bombs. When challenged as to what his idea actually is, his response sets the Modus Operandi not only for this Doctor, but for many to come – “That’s the trouble with ideas – they only happen a bit at a time.” The “Thing In Progress” is born right there in Revenge of the Cybemen. Ultimately, Revenge of the Cybermen is frequently overlooked, and often suffers by comparison to stories that no-one has seen in their entirety for decades thanks to the wiping of episodes in the sixties (meaning people make up the visuals for themselves and blow themselves away). But on rewatching, it adds substantively to our understanding of what the character of the Doctor is allowed to be, with Baker in fantastic form, and, despite being utterly typical of the sixties Cyber-stories that preceded it, and consigning them to on-screen absence for another eight years, it lays the groundwork for the evolution of the Cybermen throughout the 80s, acting as a blueprint for the Cybermen that a whole generation remember as a favourite Doctor Who monster.